It features a 3” arm and is ideal for tight areas where a smaller mount is beneficial. It features an AMPS drill mount base as well as an AMPS head. The mount can be drilled into solid, flat surfaces, such as walls, tables, and workbenches and is compatible with devices having a 4-Hole AMPS pattern, including cameras, GPS devices, or satellite radios. The AMPS pattern consists of four holes located in a rectangular pattern spaced at 30.17mm x 38.05mm (measured as the center-to-center distance between holes). 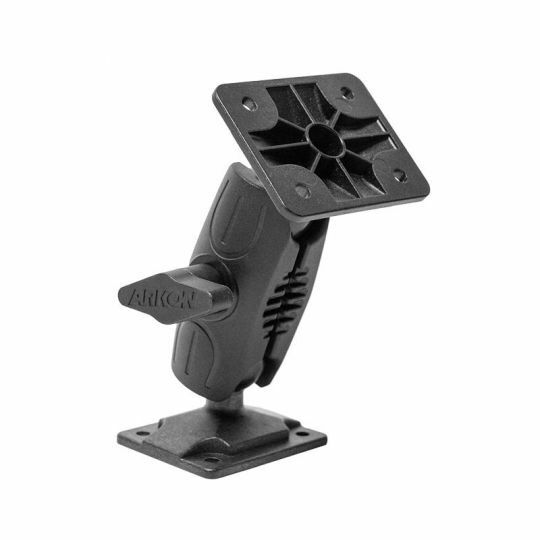 This tough mount is also ideal for mobile radio holders, housings, and other devices used by public safety, construction, and utility applications. This package includes only the Heavy-Duty 4-Hole AMPS Mount with 4-Hole AMPS Head. This tough, low-vibration mount measures 4.13 inches high from end to end and is made of a combination of nylon and fiber. The arm of the mount swivels on both the top and the bottom, providing 360-degree rotation and the ultimate flexibility in positioning the device at any angle.